Ramsey Historical Association » Blog Archive » The Ramsey Farmers Market Proudly Announces Its Third Season! This winter season our Ramsey Farmers’ Market took a leap of faith when it ventured on to become Bergen County’s first community based indoor farmers’ market. Choosing the Eric Smith School cafeteria for a location and held every Sunday from December through March, over 20 vendors brought their seasonal produce and great artisan products for our community to continue to enjoy. Word spread rapidly and farmers’ market followers appeared from so many surrounding towns, a few new farmers and vendors joined the market and our winter market became a wonderful success, thanks also to the efforts of a talented and dedicated farmers’ market committee and support from Mayor Chris Botta, Borough Council members and our Council Liaison, Vanessa Jachzel. 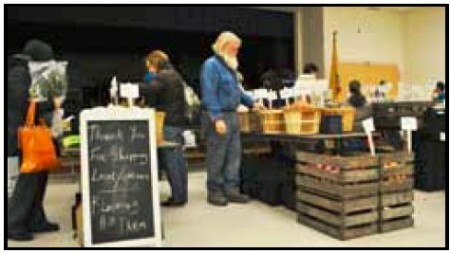 Farmer Guy Jones, owner of BloomingHill Farm and former long time Ramsey resident, checks his organic produce at the indoor winter market as market goers choose from his seasonal produce. Sponsored by the Ramsey Historical Association, the Ramsey Farmers’ Market will begin its 3rd season outdoors at the Main Street train station on June 10th, kicking off with our traditional Strawberry Festival hosted by the Woman’s Club of Ramsey. The market will continue outdoors every Sunday 9AM – 2PM through November 18th. Planning is already well on the way for another season offering the freshest produce and products from local farms and vendors. The market has planned plenty of family fun, music, chef demos, artisan exhibits, children’s crafts, and special events and hopes to serve as a resource for helping to make our town one committed to environmental sustainability and healthy living. The outdoor market will continue its Pay it Forward program where visitors can bring non-perishable food items for donation to the Center for Food Action in Mahwah. 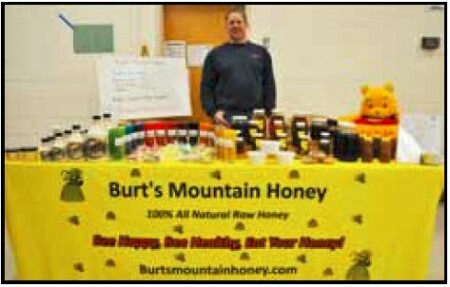 Visit the market website www.ramseyfarmersmarket.org for a schedule of events and list of vendors.